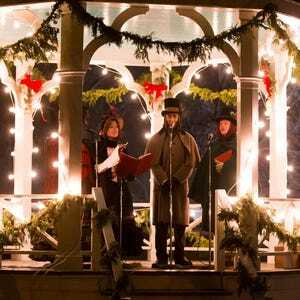 In an array of settings, the family-friendly event offers song, dance, theater, caroling and horse-drawn carriages. The annual Noel Night celebrates Detroit’s diverse holiday traditions as well as its rich arts and cultural scene, and this year, more than ever, the event will be packed with entertainment, dining and shopping venues. The 44th annual event in the city’s Midtown district will be held 5-10 p.m. Saturday. In an array of settings from galleries and museums, churches and an ever-growing collection of businesses and restaurants, the family-friendly festivities include activities like dance, theater, crafts, caroling and horse-drawn carriage rides. The evening culminates with a traditional community sing-along on Woodward at Kirby, led by the Salvation Army Band. The free event, which drew 40,000 visitors last year, will feature a record 100 venues and more than 200 performances at a cost of about $200,000 for Midtown Detroit Inc., in addition to a $300,000 investment by participating businesses, said Annmarie Borucki, special projects manager for the nonprofit community development organization. “Because of the rapid development in Midtown, we have more new venues participating for the first time,” Borucki said. One newcomer will be the Lawrence Tech University Center for Design + Technology, which opened earlier this year at Woodward and Willis. The satellite location, which focuses on research, outreach and community, will transform its 900-square-foot first-floor gallery into a pop-up shopping experience featuring two local vendors — Farmers Hand organic produce market and SMPLFD clothing company. Another newcomer, the Little High Flyers baby boutique is having its grand opening that night and will offer a workshop by Detroit artist Yvette Rock featuring dolls and stocking making. Detroit native Monica Blaire, a Kresge Arts fellow who moved to Atlanta two years ago, is coming home for her first Noel Night performance. Supported by a full band and backup singers, Blaire will perform at 8:45 p.m. at the Charles H. Wright Museum of African American History. Other new participants include ArtCity-Creative Spaces, the BLOCK Detroit, Blossoms Midtown, Cake Ambition, Cass Community United Methodist Church, Dangerously Delicious Pies, El Moore Lodge, Elite Couture Boutique, Filson, Flyball Labs, HopCat Detroit, Mac n’ Brewz, Mills Apothecary, Mosaic Midtown Church, Rock City Eatery, Third Man Records and more. Perennial favorite, the Ice Scraper Challenge, returns to the Detroit Institute of Arts plaza, and Live Animals of the Nativity will be back on the lawn of the Cathedral Church of St. Paul. Also returning is the College for Creative Studies student and alumni art sale, along with the Detroit Artists Market’s annual Art for the Holiday show. In addition to participating restaurants, the Detroit Public Library will host a food court and beer tent, and the Scarab Club will host its annual food truck rally in its parking lot. Detroit resident Kalia Keith, a Noel Night regular, said she’s attending this year. “During a season when money might be tight, this is an opportunity to enjoy city life and holiday festivities for free,” said Keith, 40. Mary Chapman is a Metro Detroit-based freelance writer. What: A one-night festival featuring events, performances, demonstrations and festivities at more than 100 venues in midtown Detroit. Where: The area bounded by Ferry and St. Antoine streets, Edmund Place and Third Avenue. Woodward is closed to traffic between Antoinette and Warren. Parking: Area lots and decks. Free shuttle service offered between parking decks and participating venues. Lyft is the official ride-sharing partner. New users can download the Lyft app and apply the code NOELNIGHT16 for $20 credit. Information: See noelnight.org for a map and list of venues, or call (313) 420-6000.